Smooth, sweet singing sustain is the name of the game with this overdrive. The Drive ranges anywhere from a clean boost to a full on overdriven amp that reminds even the most skeptical of the coveted Dumble Overdrive amplifier. The amp-like dynamics of this pedal are truly a treat to those of us bogged down in compressed, seemingly lifeless overdrive pedals. The Tone knob offers a sweep throughout the expected tonal spectrum giving you the capability of a smooth lead guitar or a crunchy driven sound. The Voice knob is a unique filter that simultaneously affects gain, dynamics, and tone. Roll off the Voice knob and experience the warm spongey amp-like overdrive that is on tap. Roll up the Voice and increase your sustain and harmonics. In combination with the Tone knob, this control offers unheard of tonal possibilities. Do you own a Blackface amp? Are you craving the characteristic brown sound associated with a vintage JTM-45? Fret no more, the AES-45 is here. Designed to emulate the sound of an overdriven Marshall, this pedal will transform any amplifier into a dynamic gain machine suitable for anything from Rock 'n' Roll, Blues, to Country. This pedal frees up your wallet to spend on other things than a $2,000 amp. The Gain knob allows you to move anywhere between a sparkly clean boost to full on sustain. The Volume offers a tremendous amount of boost that will send your tube amp into saturation. The Tone knob works just like its big brother amp allowing a range that will accommodate a wide variety of guitars. If you are looking for that "Brown Sound" and don't have many dollars to spend, this is the ticket. 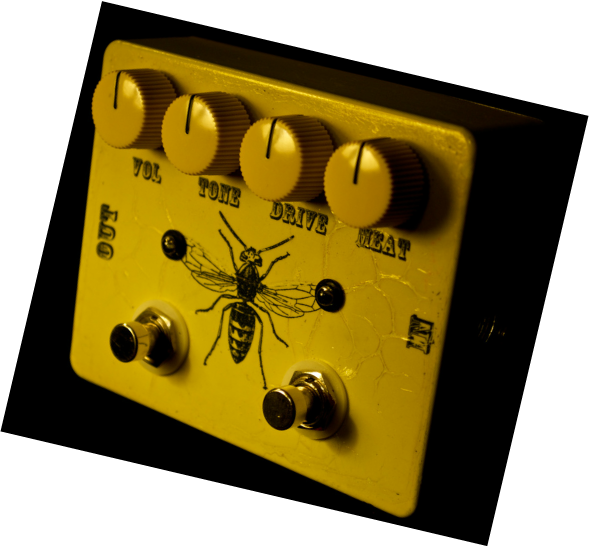 One of the most versatile and high gain pedals available from Stovall Amplification, the Hornet will make your guitar sting! This pedal has two channels: Drive and Meat. Meat comes first in the signal chain, slamming the front end with a ripping fuzz tone with more volume than is even safe to have available. IT IS LOUD. The Drive channel offers a huge range of tones all allowing maximum transparency. This pedal sounds amazingly clear with humbuckers. Stack the two channels and you will experience a ripping endless sustain combining the best of the transparent Gain channel and the over-the-top Meat channel. This is one pedal that will send your guitar tone in front of any band.